Some thoughts and reminiscences from this year’s Solmukohta (Knutepunkt) in Finland. Solmukohta started as a conference/festival of Nordic larpers and has become a conference/festival of international larpers interested in the tradition of Nordic larp. I’ve been a regular Knudepunkt goer since the third one in 1999. I haven’t missed a single event before last year’s one in Denmark. Which meant it was amazing to go back there this year when it was held in Helsinki. This year apart fro m all the Nordics, I talked to people from Russia, Croatia, Israel, Germany, England, Latvia, Italy and the United States. On top of that I know we had visitors from pretty much all around Europe from Portugal to Latvia, from England to Bulgaria. So it’s really becoming international. The editor of this year’s Solmukohta book States of Play, Juhana Pettersson, observed that ”Nordic larp” has become a tradition independent of the Nordic countries. So you can have Nordic larp in Mexico or Egypt. But you can also have larps in Finland that belong to some other tradition or remain more or less unaffected by that tradition. And that way you can even have Nordic larp being in dialogue with Finnish larp, and I guess my own Täällä Kirjokannen alla had quite a bit of that going on. 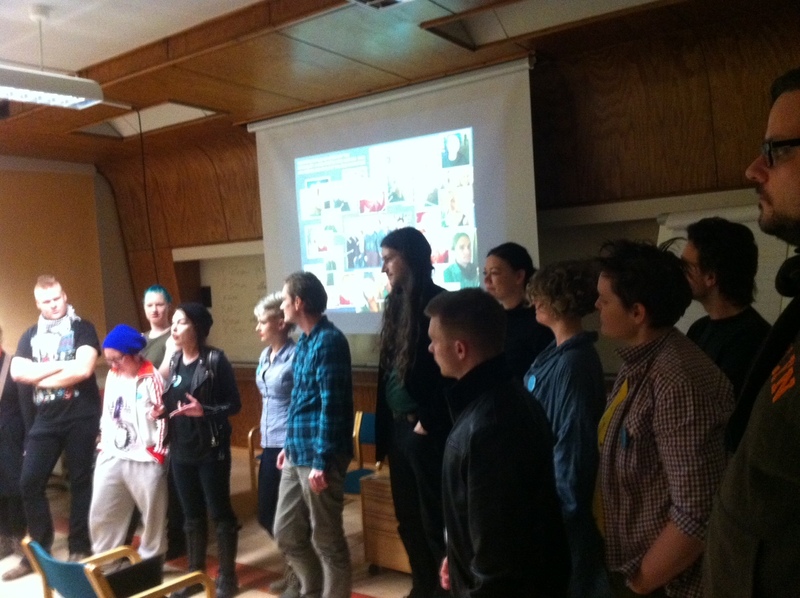 For me the whole experience started with the Nordic Larp Talks on Wednesday in Club PRKL in downtown Helsinki. You can see my talk titled How To Become a God, and all the others here. Would you buy a used god from this man? Photo by Tuomas Puikkonen. Next day all three hundred and sixty of us got on buses that drove us to the conference hotel Kiljavanranta next to some lake in the middle of the Finnish forest with some patches of snow left. I ran two programs this year. One was called the Folk Fantasy Workshop, based on my article in States of Play (PDF). I gave a short presentation on the world in Täällä Kirjokannen alla, and then we started workshoping on taking each participants’ own country/nation/tribe/city/identity and turning that into a folk fantasy world. We had people from Sweden, China, Croatia and Russia present, and we had hardly gotten started when we already had to stop. The workshop might’ve been over ambitious, but I think the participants still made some interesting connections and maybe had some ideas they can later use for whatever they wish. The other item was originally titled Contacting the Characters Within You, a self-help kind of approach to taking the roles and characters we carry around with us and using them for other things. Since the workshop was scheduled for Sunday morning, I had to rename it Hangover Yoga Workshop (and Contacting the Characters With You). We started with twenty minutes of simple yoga exercises designed not to feel too bad for the hungover people, and wake everybody up a little bit. Then we started meditating on the characters we’ve played trying to identify five archetypes. The Good One, The Trickster, The Leader, The Shadow and The Brain. Not everybody had experience with all of these, but I think people sort of got the idea. We examined each one a little bit, and then chose two of them. Those two we made our own, trying to develop their physical language and put them on and off faster and faster. The idea was that the participants could learn to call on these characters in tricky situations in their ordinary life. For example a test might be very difficult for the participant in their everyday role, but putting on the role of The Brain might help them deal with it better. Different situations might require taking on different roles, and these sorts of exercises will hopefully help people to identify them better. I think the workshop was a success since many people came to thank me for it later. I’m not an expert yoga master, either, but I think that went fine, as well. One of the many highlights was being able to buy an early copy of Leaving Mundania from the author Lizzie Stark. I knew who she was since people had told me she visited last year’s Knudepunkt in Copenhagen. Leaving Mundania is a non-fiction book about larpers and the larp scene. It mostly focuses on larp in the United States, but the last chapter is titled Knudepunkt Blew My Mind. It was thrilling to read an excited outsider’s perspectives on the whole scene and the games we play and the the people we know. Of course, Lizzie’s not an outsider anymore. She signed my copy ”Turku this!” Ironically, I accidentally left the book in the Turku School room (all the rooms were named after concepts in larp theory). So I really did Turku it. The next day it was gone. If you have it, I want it back! The Pan-European tv drama / larp / transmedia experience The Spiral (formerly The Artists) is partly built by larpers, specifically Martin Ericsson and Adriana Skarped. They showed us a sneak preview of the tv show’s trailer, which seemed really cool. Parts of the whole thing are made through a larp, as some sort of mocumentary. Difficult to explain, but you should totally follow it when it airs in September in several European countries including Finland. Or take part in the larp parts – it’s not too late! Some players of The Spiral with game mistress Adriana Skarped in the middle. The social aspect is very important in these events. Even though I went to bed quite early on two nights, I had a chance to party it out Saturday. DJ Hakkis’s 90’s gothic hits marathon was well appreciated! Also interesting discussions on commercial larps in Siberia, how Taoism relates to the works of Ursula K. Le Guin, politics in Israeli larps, German film funding, the great roleplaying theories of the day, capitalism and socialism in post-apocalyptic Swedish larps and lots of other great stuff. There’s an influential indie roleplaying scene mostly in the US, but also internationally, that used to be associated with the forum The Forge. Over the years they’ve sent one or two ambassadors that usually get converted, but this time it seemed like there was a whole faction of these great people. Some came to preach, others to listen, but continuing this dialogue between ambitious clicks is very fruitful. The Swedish/Danish jeepform tradition is, I think, a sort of love/hate child between Nordic larp, US indie and Danish tabletop. The US indie crowd is discussing Solmukohta at the Story Games forum. 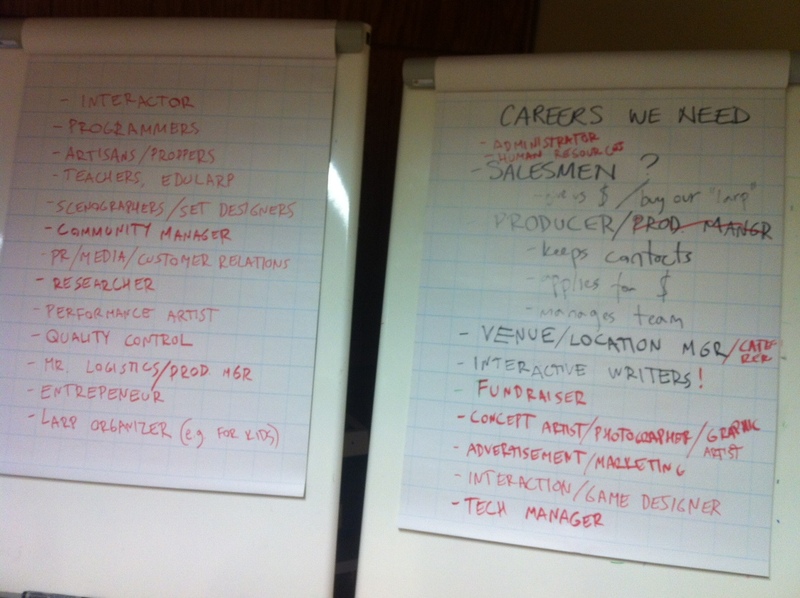 Ideas on jobs available for larpers because of their larping skils. “We have a special way of playing the post-death game.” -Alexey Fedoseev on Russian larps. A StPetersburg game had in-game elections. If the conservatives won, the city was taken into history. With liberals, to the future. Larps are not artificial, they are artifactual. The Hollow Man Syndrome = there is no character, the player has to use their own experiences. Read the book The Art of Curating Worship, a guidebook for Christian priests. Solmukohta 2012 appreciation thread: http://laivforum.net/threads/20275-Solmukohta-2012-appreciation-thread! 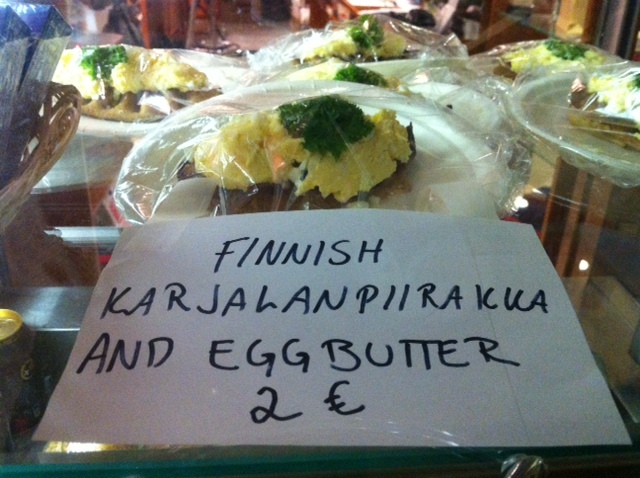 A Finnish delicacy with an informative sign. If you’re interested in what’s going on in the fields of participation, interaction or roleplaying, I recommend spending this evening at Club PRKL in Helsinki or online following the webcast. It’s the publishing of the new Solmukohta journal States of Play followed by Nordic Larp Talks. The doors open at 6pm, the excellent book States of Play is published at 7, and Nordic Larp Talks hosted by Johanna Koljonen starts at 8! States of Play is edited by Juhana Pettersson and has dozens of really interesting articles on the design, theory, documentation and results of the cutting edge Nordic tradition of live roleplaying. My article Folk Fantasy deals with Täällä Kirjokannen alla and what I think might be the dawn of a new era in the fantasy genre. The book is also published as a free PDF. 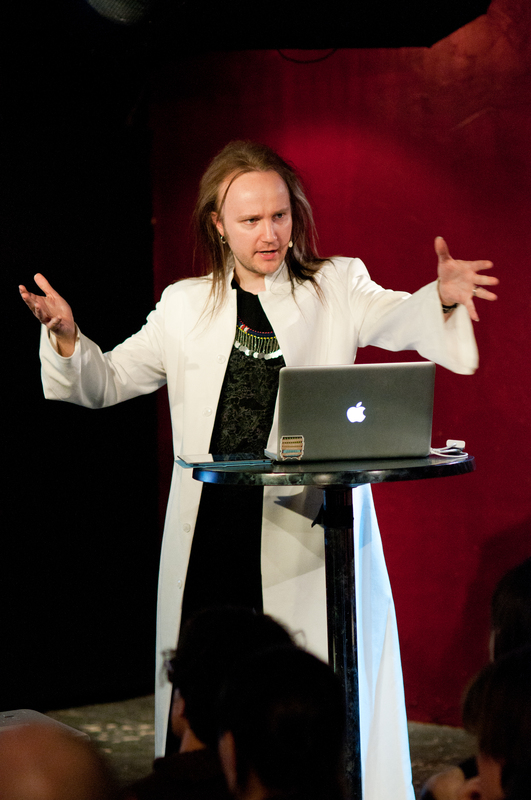 We are proud to welcome you to Nordic Larp Talks Helsinki 2012 – an evening of entertaining, thought-provoking and mind-boggling lectures about projects and ideas from the Nordic tradition of live action roleplaying games. The talks are presented by writer, radio & television host as well as winner of the innovator category of this year’s The Swedish Grand Journalism Prize award, Johanna Koljonen. You can follow the talks live streamed on nordiclarptalks.org Wednesday April 11th 8pm EEST or at the PRKL club in central Helsinki, Kaisaniemenkatu 4. My presentation, How To Become A God, deals with the history of drama from Dionysian rituals to reality television, and beyond, and how all of this relates to roleplaying. While doing that, I’ll also answer a puzzling point in Aristotle’s Poetics that’s been bugging theatre scholars for three thousand years. Fastaval, Mark Rein-Hagen, Bona the Robot!